My name is Sami Sadaghiani. I work as Partner + COO at Playground Inc. I am proud of how much I’ve grown mentally, professionally, and emotionally since we started Playground. I’m proud of having built a culture that attracts smart, passionate, and opinionated people. 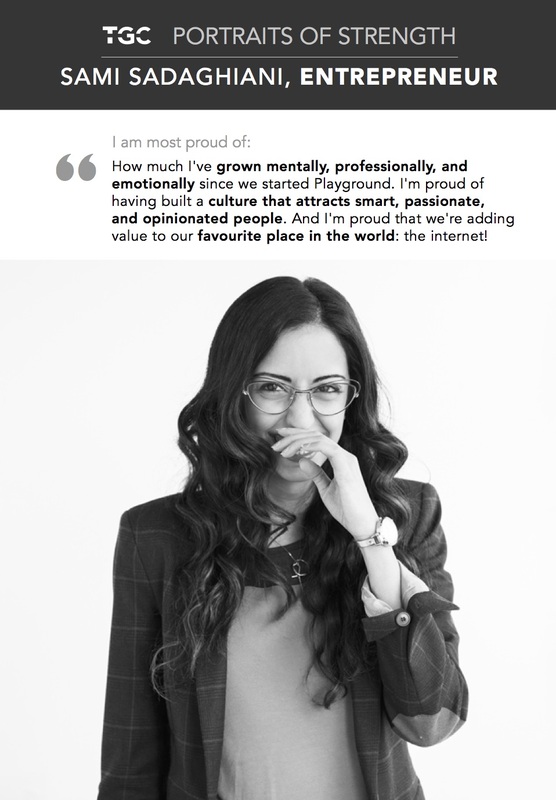 And I’m proud that we’re adding value to our favourite place in the world: the internet! The biggest obstacle I have faced was that inner voice that tells you you’re not good enough. It still creeps up but I’ve gotten better at shutting it up. My advice to women is don’t be afraid to step outside of your element. It becomes less scary once you realize everyone else is faking it too — all the time!